Do you want to get more done? Do you want better control of and access to your information? Do you want to effectively remember tasks, appointments, calls, and critical dates? Do you want to efficiently document and build on your personal and team brainstorming? Do you want to be better? At everything!! If so, you should be using these tools! Note: I’m not going to cover time and task management, as I covered Google Calendar & Google Drive in my prior blog series. Suffice to say, for a cloud-based, time, tasks, and team collaboration toolkit, it’s hard to do better than Google Calendar and Google Drive. I’ll admit, I’ve become a tad fanatical about these tools….mostly because they are free or nearly free, cloud-based (like Google), and so functional! Admittedly, I’m a little bit late to the Evernote game. But I was asked by a coaching client to help them organize their time, tasks, and goals – and they wanted to use Evernote. So, I took some time and discovered what it’s all about. Evernote note is a personal and collaborative information manager. What makes it great is the ability to sort, tag, save, and share almost any piece of information you might have or find. Email, web pages, audio clips, video, images, text that you type, etc. Evernote can store it into one or more “folders” that you create. You can also “tag” each item (Note) with one or more tags – creating a great taxonomy (organized categories) for saving and quickly finding the information you need. Better web/cloud product. The information syncs perfectly, but the option to sort by tag is non-existent. Better mobile integration. Same as above. I want to sort and filter by tags. But for storing information it’s simply amazing! Skitch is a screen capture/image creation and notation tool. No really, it’s simple, fast, and amazing! It is probably my current geeky indulgence. But it is NOT just a toy – it is a great documentation tool. Documentation – providing clarity – is one of the most critical, but under-implemented pieces of any organization. Using Skitch, Evernote, and Google Drive, you could quickly create an online library of documentation for almost every process and project you have. I’ll show you a sample image below created in skitch. Images can be copied and pasted into Evernote, Google Docs, Microsoft Word, Powerpoint, etc. Or you can save them to your hard drive and upload them to your blog/website, as I’ve done. I don’t know! A free video capture and edit tool? 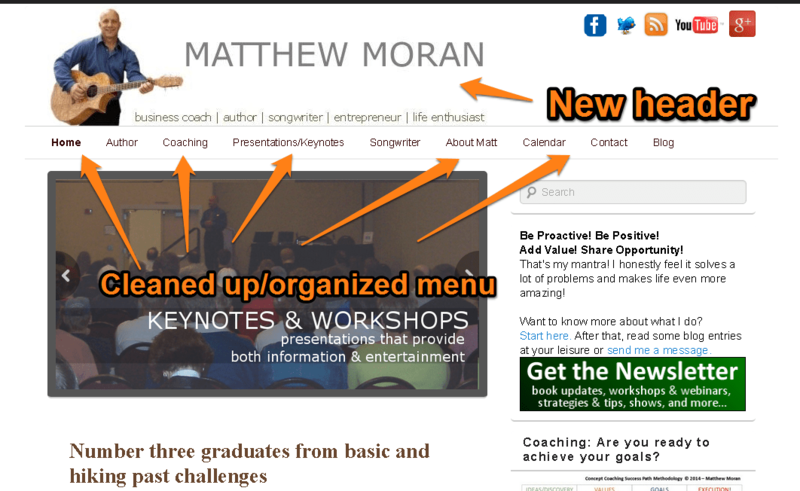 I did a quick screen capture of my website and made some notes in Skitch. It took seconds! I still haven’t found the perfect CRM (“The System does not exist, a system is critical”). CRM – Customer Relationship Manager – i.e., contact resource manager. Basically, a tool to track clients, organizations, and the communication with those entities. I’ve tried a bunch of them, helped organizations implement them, and just never been that happy. However, I have a Director of Sales for Pulse Infomatics and a Manager who is getting me speaking engagements and helping with other activities. We needed a more complete way to track our contacts and organize that communication. We had been using a shared Google Sheet for this, but given the follow-up needs and a desire to see when/if someone else on the team has contacted a client, that sheet quickly became unwieldy. Insightly allows a FREE account for up to 3 users – perfect! There are some premium features we want, so we’ll be upgrading this soon. But, even the FREE version provides amazing functionality – like tracking email communication to your clients. When sending an email to a lead or client, include a special Insightly account email in the BCC field and that email communication gets copied to the contact record in Insightly. This way, my team and I can see what anyone has sent to each contact. It integrates with MailChimp and several other communication and productivity applications… including Evernote! Drag and drop tagging, like Evernote. Heck, drag and drop many management features – i.e., drag contacts into an organization, drag contacts and/or tasks onto the calendar. I like “drag and drop” for rapid information management. The ability to edit custom filters, rather than creating new filters. The ability to create negative filters – i.e., does not contain “X” info. The Insightly Home (activity screen) and the Insightly Contact screen using a “tag” to filter the list. All of these have mobile integration (apps) for both Android and iPhone. Most people never touch the surface of the power of each of these applications – let alone put them together into a cohesive personal productivity system. Advice: You have Google & YouTube. Or Call me! Advice: think about that… not enough time to make yourself more efficient and to better keep track of your time and tasks. Really? Advice: No system is also a system. And you are managing (or mis-managing) that already. This is what I do. I help people setup and manage their systems. If you have questions on integrating them into a cohesive personal productivity strategy, contact me. It costs nothing to have a short conversation, but it is extraordinarily expensive to have a bad (or non) system. Posted in Coaching, Tools and tagged cloud, contact management, CRM, productivity, tasks.